FILE - Iranian Military Chief of Staff General Mohammad Baqeri meets with Turkish Chief of Staff General Hulusi Akar (not seen) in Tehran, Oct. 2, 2017. Iran and Syria are developing even closer defense ties as is evident in the recently concluded visit to Damascus by Chief of Staff of the Iranian Armed Forces Major General Mohammad Bagheri, analysts say. The two countries signed a memorandum of understanding announcing plans for closer military cooperation and coordination. Maj. Gen. Bagheri, who was heading a delegation of some senior officers from the Iranian military, also visited the frontlines in the northern province of Aleppo where most Iran-backed forces are stationed. Israeli Prime Minister Benjamin Netanyahu attends the weekly cabinet meeting at his office in Jerusalem, Oct. 1, 2017. 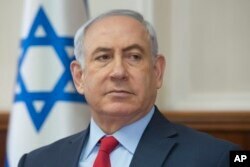 The visit occurred shortly after Israeli Prime Minister Benjamin Netanyahu warned that he will not tolerate an Iranian military presence in neighboring Syria. Analysts say that the timing of the visit signifies the rationale behind this meeting. Syrian Minister of Defense, Fahd Jassem al-Freij, center, gestures during a visit to Syrian regime soldiers in Aleppo, Syria, Aug. 9, 2016. Tehran has been one of Assad’s strongest supporters since the country’s crisis began in 2011 and has sent thousands of troops including Shi'ite soldiers from its neighboring region to support Assad's regime. Tehran says its forces are in Syria to protect the Zeinab Shrine in Damascus, a Shi'ite holy site. Some analysts say that by signing a comprehensive military deal, Tehran may also be trying to respond to Washington regarding a harsher new policy the United States adapted toward Tehran. President Donald Trump makes a statement on Iran policy in the Diplomatic Reception Room of the White House, Oct. 13, 2017. 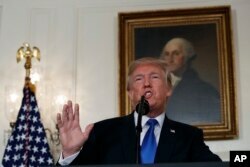 On Friday, President Trump announced his new strategy toward Iran, adopting a more aggressive stance on everything from the nuclear deal to Iranian ballistic missiles. Trump directed the Treasury Department (IRGC) to impose additional sanctions against Iran’s Revolutionary Guard Corp. The Treasury designated the IRGC as a supporter of terrorism for its backing of the Quds Force, which conducts operations outside Iran. What Is Turkey Up to in Syria?